More than $100,000 has been raised for the endowment to award an annual $2,500 scholarship to a social sciences student committed to social justice and public service. More than 520 alumni, community members, and friends of Zimmerman (Stevenson, sociology) have contributed since the fund was created soon after Zimmerman’s death. The fund has grown to a size where two annual scholarships may be awarded in the future. At age 11, Sweeney lost her mother to cancer. Two years ago she received a $10,000 grant from the Livestrong Foundation to start a campus chapter of Camp Kesem, a summer program that supports children coping with a parent with cancer. She has since raised $180,000 to expand the camp. In addition, as a student, Sweeney volunteered at Barrios Unidos and was a resident advisor at Cowell College. She also trained as a lead investigator at the Santa Cruz Public Defender’s Office to examine domestic violence, battery, petty theft, and alcohol cases, and is considering law school and the Peace Corps after graduation. “I believe Katie Sweeney exemplifies the values and commitment to public service exemplified in the all-too-brief life and work of Gabriel Zimmerman,” faculty advisor Mary Beth Pudup wrote in her nomination letter. Helping present the award was Ian Zimmerman, Gabe Zimmerman’s cousin. He thanked UC Santa Cruz and the fund’s many donors for helping keep his cousin’s memory fresh. Also attending were the first Zimmerman scholarship winner, Yethzéll Díaz (College Nine, ’12, Latin American and Latino studies and sociology) and the 2014 winner Arash Mohajerinejad (Oakes, ’14, sociology). 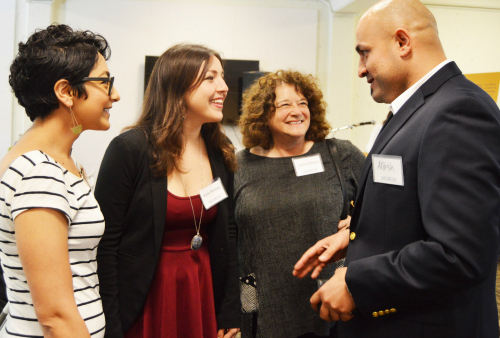 Díaz, who now works for Digital Nest, the Watsonville non-profit founded by alumnus Jacob Martinez (Oakes '04, ecology and evolutionary biology) to bridge the digital divide, reflected how she was deeply honored to be the inaugural recipient. A job in public service means being a public servant, engaging day in and day out with lived experiences. It is a process that we celebrate today, she added. Mohajerinejad, who fled his native Iran in 2003 after taking part in student protests, said he traveled to Tucson six months ago to pay his respects to Zimmerman. "I went to the place of tragedy to feel and connect him better and understand the tragedy with my soul," said Mohajerinejad who lives in the East Bay. Social Sciences Dean Sheldon Kamieniecki served as the master of ceremonies. “Throughout the luncheon we heard stories of students who have overcome great obstacles and engaged in amazing research and volunteer activities,” Kamieniecki said. Also honored were 10 undergraduates who received a Dean’s Award for an outstanding undergraduate research project–including three who received a Chancellor’s Award. Also recognized were this year’s recipients of the Keeley Coastal Scholarship, Walsh Scholarship, Weiss Family Scholarship, and the Milam McGinty Kaun Award for Excellence in Teaching.